I love biscotti. You bake a batch and they can stay around the kitchen for a week or two (since they generally produce a large amount of cookies) and you don't have to worry about them not tasting as fresh as the first day, because if anything, biscotti just get better over time. 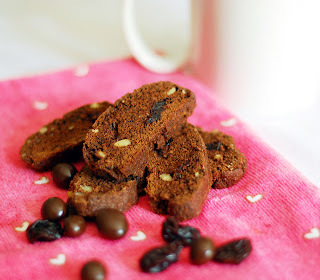 I make a different batch of biscotti about once a week and last week I was craving chocolate badly. I didn't want to just do plain chocolate biscotti so I added in a bit of espresso, dried cherries and toasted walnuts. 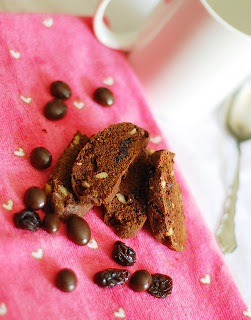 The additions made these biscotti a bit harder to slice after the first baking, but in my opinion it was worth it! The flavor combination is lovely and pretty perfect when dipped into a steaming mug of black coffee in the morning (or even a cold glass of milk before bed). Perfect for the crisp, cold fall and winter mornings ahead! Combine the egg whites, oil, and coffee or espresso in a small bowl. Combine all the dry ingredients (flour through salt) in a larger bowl, whisking to make sure everything is combined. Add the egg white mixture to the dry ingredients and stir in the nuts and cherries. Divide the dough into two equal portions and form two logs on the baking sheet, each about 12 inches by 1 inch. Flatten the dough a bit and place in the oven until the logs are firm, 25 to 30 minutes. Let them cool AT LEAST 30 minutes, preferably almost completely before slicing. If you try slicing them before then, they will crumble horribly. After they've cooled, cut each log into 1/2 inch slices and arrange the cookies on the baking sheet. Bake in the oven again until they've crisped up, about 15-20 minutes longer. September means beginning of major soup weather. You can (and I do) make soups all year 'round but when you make soups in September through April, no one makes faces or thinks you're crazy. To go along with steaming bowls of delicious chicken-vegetable gumbo, I made these lovely rolls. 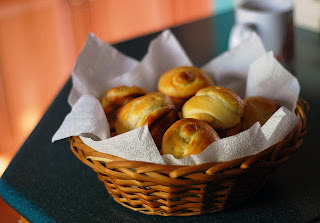 They made a perfect accompaniment to the soup, but the leftover rolls were amazing toasted, spread with butter and jam for breakfast or just re-warmed for a few seconds in the microwave to make them taste freshly baked again. I used this recipe but used white whole wheat flour instead of regular whole wheat. The dough was incredibly sticky even after rising so the cloverleaf shape was a no-go, I just did knots instead (and was reminded of my days in culinary school when we had to do 4 dozen knot rolls every day...) Anyway, if you want to do the cloverleaf shape, after forming the dough into 12 pieces, you cut the 12 pieces into 3 each and roll them into little balls, then place into the muffin cups, let rise and bake. They are adorable, but the knots are much faster and taste just as good. Had the dough been less sticky, I might have attempted the cloverleafs! Combine the yeast and warm water in a large bowl, let stand for a few minutes until foamy. Add 1 1/2 cups bread flour and the white whole wheat flour along with the honey, melted butter and salt. Stir until a loose dough forms, then turn out onto a floured surface. Knead the dough, adding the other 1/2 cup bread flour, until it's springy and elastic, about 8-10 minutes. Place in a greased bowl and let rise in a warm place until doubled in size, 45 minutes to an hour. Preheat the oven to 425 degrees F. Divide the dough into 12 equal pieces (I weighed the dough first, then divided the total weight by 12. Each piece was about 2 ounces.) Roll each piece into a 5-6 inch rope, then make a knot and place on a parchment-lined baking sheet or into greased muffin cups. Cover with plastic wrap and let rise until doubled, about 20 to 30 minutes. Beat the egg and 1 tablespoon water and brush over the risen rolls. Bake in the preheated oven until golden brown, 12 to 15 minutes. Serve warm. From the same book as the gluten free vanilla cake, this is my go-to gluten free chocolate cake. It's absolutely chocolaty and delicious. You can switch sugars here, brown for granulated, if you'd like. I usually use all brown sugar because it tastes fudgier that way, but feel free to use either one. Preheat the oven to 350 degrees F. and lightly spray or grease 2 8-inch round cake pans and set aside. Sift together all of the dry ingredients (whole bean flour through cocoa powder) to make sure everything is thoroughly combined and there are no lumps. Cream the butter and brown sugar until light and fluffy. Add the eggs one at a time, beating well after each one. Stir in the vanilla extract. Add in the dry ingredients and the sour cream alternately, beginning and ending with the dry ingredients. Scrape the batter into the prepared pans and let sit for 15 to 30 minutes before baking. 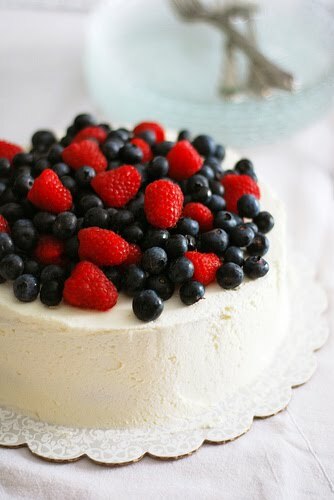 Bake in the preheated oven for 35 to 40 minutes or until a toothpick inserted in the center of a cake comes out clean. Let cool completely before filling and frosting. As with the gluten free vanilla cake, this cake freezes very well. Just wrap it tightly in plastic wrap first and store for up to 3 months. In late August my dad developed a really bad cough and he couldn't sleep at night. A few days after he started getting better, I developed a bad cough and couldn't sleep at night. I still have no idea what it was - my ears were plugged up, I couldn't hear, I had no voice, I was dizzy, and the lack of sleep made me no fun to be around. The first thing I did when I started feeling better was bake bread. It made me feel normal again to be in the kitchen, kneading dough and creating something delicious for myself and my family to enjoy on the first really cold and dark day of September. It filled my house with warmth and one of the best scents in the world - baking bread. There are few scents I want to smell more than bread baking after being sick for two weeks. I used this recipe from Taste Of Home. I made the recipe twice and made one smallish 9x5-inch loaf and the cinnamon swirl heart bread you see pictured here. It makes a deliciously soft, fluffy and golden bread, I highly recommend this recipe for a great sandwich or toasting bread. Combine the yeast, sugar or honey, and water in a large bowl and let stand until foamy and the yeast is dissolved. Add the flour, salt, milk and butter and stir until a soft dough forms. On a lightly floured surface, knead the dough until it's elastic and springy, 8 to 10 minutes. Place the dough in a greased bowl and cover. Let rise in a draft-free and warm spot until doubled in size, about an hour. Fold in the dough to release the air and place in a greased 9x5-inch loaf pan. Cover and let rise again until doubled, another 30 to 45 minutes. Preheat the oven to 375 degrees F. When the dough has risen, bake it until very golden brown, about 30 minutes. Brush with melted butter. 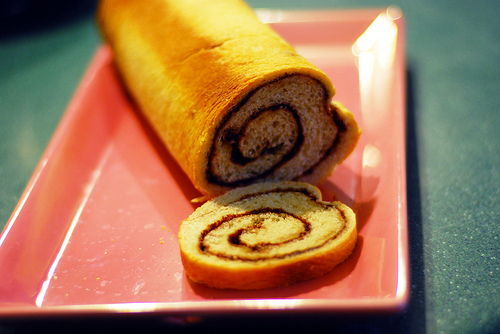 For a cinnamon swirl bread, after the first rising of the dough, roll it out into a small rectangle. 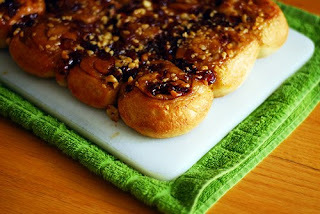 Brush the dough with about a tablespoon of melted butter and sprinkle with cinnamon sugar and roll up tightly. Place in a greased loaf pan, let rise until doubled, and bake like normal. For those curious in how I got the heart shape, my boyfriend found me a retro Valtrompia heart bread tube on Amazon and it is ADORABLE. You can use it for yeast bread and thicker cake and quick bread batters. I love mine! I had been baking cupcakes and cakes all summer, some for money, some for family, and by the time late August rolled around I just wanted to make something different, easy, yet impressive. 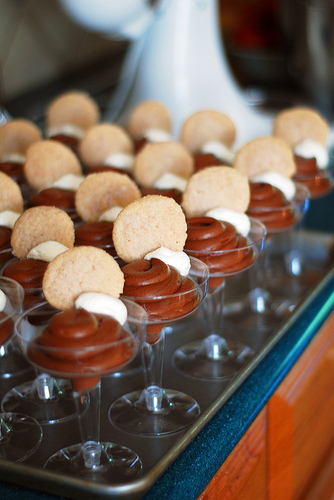 In comes chocolate mousse. Mousse is always elegant - maybe because of its decadent taste and texture - people always assume it's incredibly difficult to make. It isn't and it's too bad more people don't make it as much as other desserts! In a way it's easier than a cake or cookies because you don't have to bake it. There is some cooking involved, since there are raw eggs here, and lots of whisking. You can use a handheld electric mixer for the first parts of the recipe but I will say I used a whisk and I thought of it this way: if I whisk by hand instead of using a mixer, I can justify eating this mousse... We all make eating excuses like that, but you do burn more calories whisking by hand than by using an electric handheld mixer, right? I'd like to think so. This recipe says it makes 2 1/2 cups or serves 8 generously but I doubled it to serve 20 people with at least 3 or 4 glasses extra. I used Ghirardelli bittersweet chips for the chocolate called for because I was making it for so many people and I have to say I loved it and I won't be snobbish and say to seek out only high quality 66% bittersweet bars or anything like that (although the book does ask for this). I say use what you have - it will still be delicious. In the top of a double broiler or in a heat-proof bowl, whisk the yolks and sugar together until pale yellow and thick, the sugar should begin to dissolve and a ribbon should fall back in the bowl when the whisk is lifted. This could take anywhere from 7 to 15 minutes depending on if you're whisking by hand or using a handheld mixer. Stir in the water. Place over simmering water and cook, whisking constantly until the mixture is very thick and registers 160 degrees F. and coats the back of a spoon. Remove from the heat and add the chocolate, salt and vanilla. Stir until the chocolate is melted and then continue to stir until the mixture is cool to the touch. In a separate bowl, whisk the cold heavy cream until it forms soft peaks and gently fold it into the chocolate mixture. Cover and refrigerate about 4 hours or until cold. 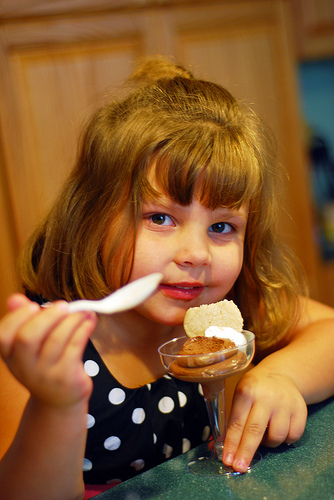 Alternatively, spoon the freshly-made mousse into glasses or bowls first and then chill. I served the mousse with some gluten free shortbread cookies and a dollop more of whipped heavy cream just because I had extra and I felt like gilding the lily. Here's the recipe for the shortbread, although the mousse really didn't need any accompaniment to be honest! These cookies are quite fragile and you need to be careful when taking them off the cookie sheets. The broken ones make great crusts for cheesecake though! Preheat the oven to 300 degrees F. and line a couple baking sheets with parchment paper. In a bowl, whisk together all the ingredients besides the butter until well-mixed. Add the soft butter and mix until a dough forms. Pinch into 1-inch balls and place on the parchment-lined baking sheets. You can flatten these with the tines of a fork dipped in sugar or I used the bottom of a glass dipped in cinnamon sugar. Bake for 15-20 minutes or until very lightly golden brown on the bottom edges. Transfer the sheets of parchment to a cooling rack to cool completely and then take the cookies off the paper carefully. 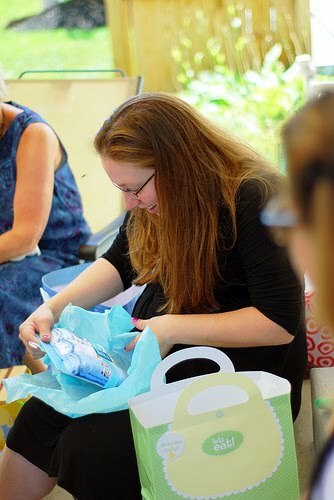 In late August, we threw my sister-in-law Rachel a baby shower on a beautiful Saturday afternoon. The next two posts will be recipes of the food I made - gluten free pizza dough and chocolate mousse with gluten free cinnamon shortbread. It seems like a lot of gluten free baked goods come in boxes and bags these days because those who need to avoid wheat find it easier or more convenient, just like the people who buy regular cake and brownie mixes. I hate to be so snobbish, but I always prefer making things from scratch and I can't stand mixes. They don't allow you to control anything! I'd much rather figure out a real recipe and perfect it. So upon first search for "gluten free pizza crust/dough" you get a lot of links and sites for mixes to buy. Once you start getting into the recipes, many had reviews such as "gummy, not fluffy at all..." etc, etc. Then I visited one of the tried-and-true recipe websites, Epicurious. Lucky for me, I found a gluten free pie dough recipe that had (mostly) rave reviews. We had all the gluten free flours in the gluten free pantry so I decided to use this one. It. is. amazing. I know the comparison for gluten free stuff is always "does it taste like the real thing?!" and this one really does, it might be even better. The thing anyone baking gluten free yeast breads should remember is that the doughs will always be more sticky and wet than regular bread dough. It's just the way gluten free bread works, don't add more flour or it WILL be tough and gluey. I found the best way to work with this dough was to use wet fingers and a greased offset spatula to spread it on the parchment paper. Anyway, if you're looking for an amazing gluten free pie crust recipe, THIS IS IT. Top it with anything, I swear you'll love it. I roasted eggplants, zucchini, yellow squash, red onion, mushrooms and red peppers a few days before the shower and then spread pesto and the veggies over the par-baked dough and topped with mozzarella cheese (I also did a pesto/tomato/mozzarella as well as pesto/chicken/roasted veg/mozzarella). A note on quantities: I doubled this recipe and made it twice to get four rectangular-sized pizzas that I cut into 8 generous pieces each (I had to serve about 20 people, every piece of the 32 pieces were gone at the end of the shower...) If you're just serving a few people, this recipe as-is should be fine. In the bowl of an electric mixer, combine the flours, xanthan gum and salt. Heat the milk and 1/4 cup of water in the microwave or in a small saucepan on the stovetop until it reaches 100 degrees F. Stir in the yeast and sugar. Add this to the flour mixture along with the egg whites and 2 tablespoons of olive oil. Using the paddle attachment, beat until the dough is thick and smooth, about 5 minutes on medium. Preheat the oven to 400 degrees F. and throw in a baking sheet as well. 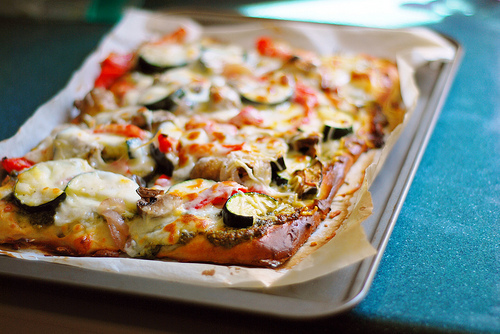 The baking sheet needs to be really hot so that when you put the pizza dough on, the bottom will start cooking immediately, therefore it doesn't get soggy or underbaked. Scrape the dough onto either one large piece of parchment or two smaller pieces (depending on if you want one large pizza or two smaller ones) and form into a rectangle, circles, or any shape you can manage, using wet hands and a greased spatula. The end formation should be about 1/4 inch thick. Drizzle the dough with the remaining tablespoon of olive oil and cover with plastic wrap and let rise about 20 minutes or until the doughs look puffier and slightly risen. Transfer the pieces of parchment with the dough on them to the hot baking sheet. Place into the oven and bake until the bottom is crisp and the dough is set, 5 to 10 minutes depending on the size. The crust is now parbaked and can be cooled completely and frozen for up to 1 month, tightly wrapped. Otherwise, use your toppings of choice and put back in the oven until the cheese is melty and golden brown or the toppings are warmed through. I made this sucker for the 4th of July and it was gooood. (That weekend was quite a whirlwind due to a family reunion and a birthday as well as the holiday so I did a lot of baking and quite frankly don't remember how many things I baked, but there was at least a sweet potato pound cake, tiramisu and cupcakes in the mix...) I also made a chocolate mayonnaise cake with Duke's Mayonnaise (a present from my North Carolina buds) but I must say, it was gone before I could get any pictures. For anyone skeptical about mayonnaise in cake, it's just oil and eggs! People at the party I took it to made faces when I told them what it was, but then when they put a forkful in their mouths, everyone said it was the best chocolate cake they'd tasted. 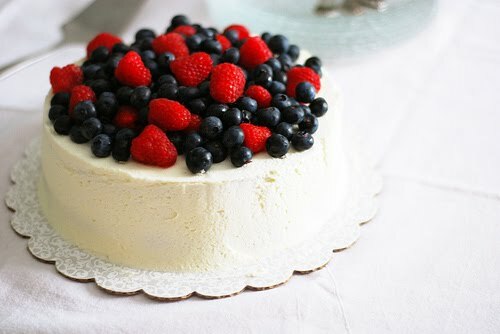 I hope to make the cake again soon, that way it can have its own post like it deserves. 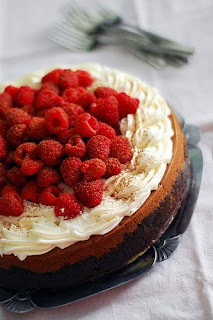 Moving on to the main star here, though - this cheesecake is gluten free, it's easy and it's delicious. The crust is made out of gluten free brownies, the filling made out of rich cream cheese and melted bittersweet chocolate. 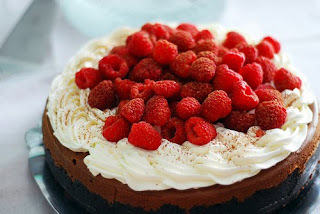 I added the whipped cream and raspberries on top, but they were just for show. This cheesecake would do just fine on its own, no matter what the situation, for people who have to eat gluten free or not. Preheat the oven to 350 degrees F. and grease an 8x8 square pan. Combine the dry ingredients in a small bowl, whisking to make sure all the flours aren't clumpy. In a large microwavable safe bowl, melt the butter and chocolate together until smooth and shiny. Add the vanilla extract and beat in the eggs one at a time until thoroughly combined. Dump in the dry ingredients and stir well to eliminate any lumps. Spread in the prepared pan and let sit for 15-30 minutes. Bake the brownies for 20 to 25 minutes or until when a toothpick is inserted in the middle, a bit of crumb is sticking to it. Let cool completely, then crumble and set aside. Preheat the oven to 350 degrees F. and lightly spray a 10-inch springform pan with cooking spray. Press the brownie crumbs in the bottom and up the sides of the pan and bake for 10 minutes. Set aside to cool. Increase the oven temperature to 450 degrees F. In a large bowl using an electric mixer or handheld mixer, beat the cream cheese until very smooth. Slowly and the sugar and sorghum flour and beat until light and fluffy. Add the eggs one at a time, beating well after each egg. Add the vanilla, salt and yogurt or sour cream, and finally, fold in the chocolate. Pour the cheesecake mixture over the cooled brownie crust. Bake the cheesecake for 10 minutes in the hot oven and then reduce the temperature to 250 degrees F. and continue to bake for another 35 to 40 minutes or until the center is just set. Let cool at least 30 minutes before refrigerating at least 3 hours or up to 3 days. I don't really care how long the gap has been or how many people actually read this blog, but I realized a few weeks ago, I like doing it. I really like writing about the food I make and eat with my friends and family and I love sharing recipes and photos to go along with them. So even if no one reads this, I'm going to try and keep it updated anyway. Because a few nights ago I was going through all the recipes I've posted thus far and realized what a good resource this is. The recipes I posted two years ago are the recipes I still want to make now, especially after losing 85 lbs. I think dieting put a real damper on recording recipes here because I only ate desserts every once in a while. 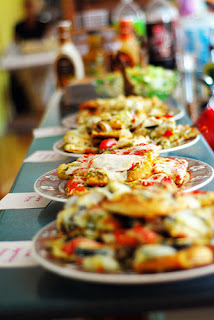 I felt guilty for posting a high-calorie, high fat recipe when I was dieting because that's not what I ate every day. Now I eat a cookie or baked good (almost) every day, and I bake 3-5 times a week rather than 1. Granted the cookies are smaller and the cakes might include more whole wheat flour and less butter now, but they still taste delicious and deserve to be shared. For the dough, dissolve the granulated sugar and yeast in the warm water and let stand until foamy, about 5 minutes. Stir in the melted butter. Combine 1/2 cup brown sugar, syrup, and milk in a small saucepan and bring this mixture to a boil. Remove the pan from heat and add in the dates. Sprinkle the nuts evenly on the bottom of a cooking spray-coated 9x13 inch baking pan. Spread the date mixture over the nuts as evenly as you possibly can, I used a small offset spatula for this and it helped. It might not seem like there's enough to go around, but I promise there is. Combine the other 1/4 cup of brown sugar and cinnamon in a small bowl. Preheat oven to 375 degrees F. Punch down your dough (I should talk about this term some time... you never want to PUNCH the dough down, more like fold it over itself so most of the air bubbles go out of it) and let it chill out for 5 minutes to rest. Roll the dough out to a 12x10 inch rectangle on a lightly floured surface and brush with the 2 tablespoons melted butter. Sprinkle the dough with the brown sugar/cinnamon mixture and roll up tightly starting with the long end. 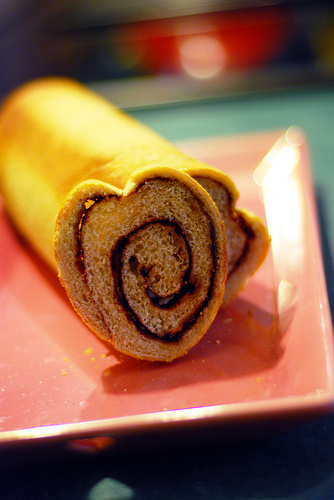 Cut the dough into about 1-inch slices, creating 12 rolls. Place the rolls cut-side up in the baking pan and cover with plastic wrap. Let rise until the rolls touch each other and have doubled in size, about 15-20 minutes.